With a slow cooker, often referred to as a crock-pot, you will save time, money, and enjoy many new options for your meals. In addition, they use little electricity, they don’t put off heat into your kitchen like an oven which is great in summertime, and they can transform tough, inexpensive cuts of meat into tender, delicious fare. You can throw in a bunch of ingredients before you leave for work, and when you come home enjoy a meal already slow-cooked to perfection and ready to eat. If you plan to leave the unit unattended, then you will want a model with programmable controls. Mechanical models require you to change the heat settings manually which is fine if you will be around your crock-pot all day. A 6-quart version is perfect for a family of four, while couples or individuals may prefer a 4-quart model or smaller. They come with a variety of inserts with the most common being stone which provides even heat. But some have a metal insert which can be used on the stove to brown meat before cooking. Buyers should also make sure that the slow cooker they want to buy is easy to clean with dish washer safe parts. We reviewed and rated numerous machines and overall we found that there was very little performance difference between lower priced models and higher priced models. Below we review our top 5 best slow cookers. 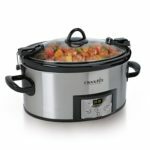 The Hamilton Beach Set’N Forget 33969A is our choice for the best slow cooker. 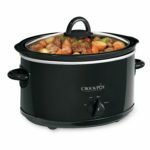 While it is the most expensive slow cooker on our list, this model is still very affordable with a price of around $48. We like that the Set’N Forget has three cooking settings – programmable time, manual, or by temperature via meat probe. The programmable mode has a 14 hour timer and we found that it slow cooks at the right temperature and does not run too hot. It is also much easier to transport safely then other models with a clipped, gasket sealed lid and full handles. About the only negative we found is that actual cooking capacity is closer to 5 quarts than the listed 6 quarts. The $38 Crock-Pot SCCPVL610-S is the best selling slow cooker on Amazon. If you need a portable crock-pot then this is a perfect choice due to its large handles and gasketed, secure locking lid. The 6 quart SCCPVL610-S has a basic timer which can be set for up to 20 hours on low or high temperature settings. It will automatically switch to warm for up to 6 hours once cook time is completed. The only negative we found is that it runs a bit hot even on just the warm setting. If you are concerned about chemicals or coatings on your cookware then you should consider the $35 Chefman 5 Quart Slow Cooker. This model uses an all natural paleo certified stone insert that is non-stick and PTOA, PTFE, and coating free. The Chefman slow cooker lacks a programmable timer and instead uses simple manual controls of low, high, and warm. The stoneware insert is oven, stovetop, and dishwasher safe. The lid does not lock down, so it might not be the best choice for a portable slow cooker. If you want a Crock-Pot with basic manual controls then the $20 Crock-Pot SCCPVL600S Cook’ N Carry 6-Quart Oval Slow Cooker is for you. It is the second best selling slow cooker on Amazon with a rating of 4.4 stars, which means the vast majority of users really like this model. Available in stainless or red, it features the basic settings of low, high, and warm. The SCCPVL600S also has a locking lid, so it is ideal for transporting to any outings you might need it at. There really aren’t any major negatives on this Crock-Pot. Just be aware there is no programmable timer. For the price this is really a great value. 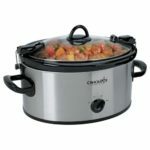 If you are looking for a cheap slow cooker or a smaller one then the $15 Crock-Pot SCV400-B 4-Quart Manual Slow Cooker is for you. Available in black, this unit is just 4 quarts which is ideal for meals for just 1 or 2 people up to 4. The SCV400-B-NP has just the basic manual settings and lacks a programmable timer. The stoneware insert and glass lid are both dishwasher-safe. Buyers should get this if they want a cheap slow cooker with manual controls.